This interesting surname is of topographical origin and is derived from the Old English pre 7th Century "haga" meaning a hedged or fenced enclosure and "land" land; hence "dweller at a fenced enclosure of land". The surname was first recorded in the mid 16th Century, (see below). 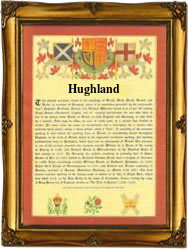 In the modern idiom the name is found as Houghland, Hughland, Hugland and Hagland. Recordings of the surname from the London church registers include; William, son of John Hughlans, who was christened on November 5th 1654, at St. Olaves, Southward; on August 11th 1661, Mary Hughland married Walter Pheare, at St. Dunstan's, Stepney; John, son of John and Martha Hugland, was christened on May 16th 1714, at St. Andrew's, Holborn; On November 9th 1783, the christening of Charlotte Hagland took place at St. Saviours, Southwark; and the marriage of John Hagland to Jenet Brown, took place on August 25th 1869, at Pentonville. The first recorded spelling of the family name is shown to be that of Richard Houghland, witness at a christening, which was dated March 15th 1558, at St. Mary Magdalene's, Old Fish St., London, during the reign of Queen Mary, known as "Bloody Mary", 1553 - 1558. Surnames became necessary when governments introduced personal taxation. In England this was known as Poll Tax. Throughout the centuries, surnames in every country have continued to "develop" often leading to astonishing variants of the original spelling.